Complaint: Misdemeanor misspelling of “coffee”; having error rendered permanent by creating signage out of it; affixing faulty signage to side of mobile caffeine/donut distribution vehicle. Warning issued for questionable use of mathematical symbols. 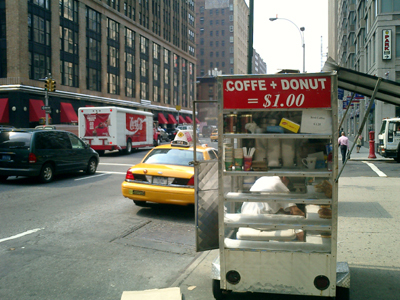 Defendant: Man selling coffee and donut for one dollar, 27th & 7th. Good price. Report: Officer was southbound on 7th Avenue when infraction was spotted. Incident occurred near the Fashion Institute of Technology, which may explain why people who draw skirts don’t spell so good. Fine: It is the nature of law enforcement officials to accept coffee and donuts in lieu of fines whenever possible.